I have always loved the Tallulah Shrug by Courtney Kelley in the November Knits book and have recently developed a love for our Magnolia yarn. It didn't take long for me to realize that the two would go together really well! I happened to be walking though the warehouse looking for something else, when I looked to my right and saw a bag of Magnolia (5415 Pale Teal) that was whispering to me – ‘Pssstt Claudine….over here. I would be the perfect color for a shrug.’ I tried to ignore it, but the voice grew stronger. And before I even knew what was happening I had a bag of the yarn in my hands and was thinking about what size needle I would need. I would say I am about half way done with the body of the garment and am planning to work exclusively on this until it is finished (let’s see how long that lasts), as it’s going to be a great transition piece. I have a few dresses and tops that will look great under it and I can wear it into late fall and then bring it back out in the early spring. In fact, I haven’t even finished this one yet, but am thinking about making one in another color and switching up the lace pattern. Do you have something you love so much that you have knit it twice? Plaid is one of those trends that comes and goes, but is never too far from the runways of Paris, Milan and New York. We have lived through the grunge plaid flannel shirts of the 90’s, a British raincoat manufacturer who is always reinventing the same tartan over and over again and school uniforms just wouldn’t be the same without them. And that’s just in the past 30 years. The plaid goes back thousands of years. So it’s no surprise to me that once again both couture and pret-a-porter designers have decided to showcase them. Our friends at Vogue Knitting are always up on the current trends and they haven't missed a beat with the re-invention of the plaid. 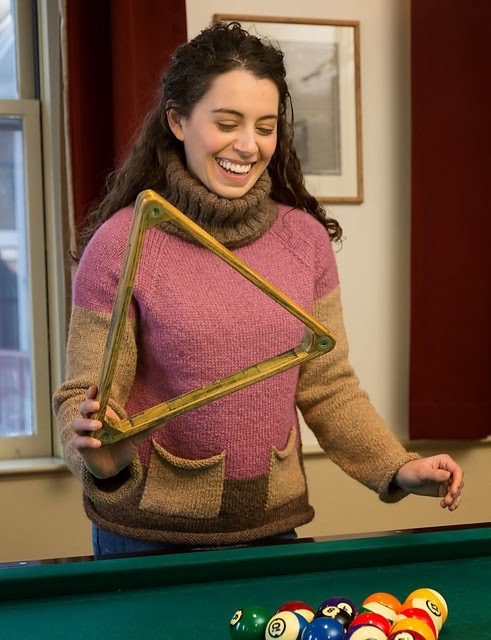 As soon as the staff at Vogue Knitting saw Nicole Miller’s scoop neck plaid pullover in her Fall 2014 show, they knew they had to have it in their Early Fall 2014 edition. Knit using Vail in 6403 Steel Gray and Silky Alpaca Lace in seven colors (2416 French Vanilla, 2432 Garnet, 2493 Ultramarine, 2452 Eggplant, 2427 Cabernet, 2409 Lake Chad and 2403 Cloud Gray) this pullover is easy to knit using a non-traditional way to achieve a plaid…all without using intarsia! 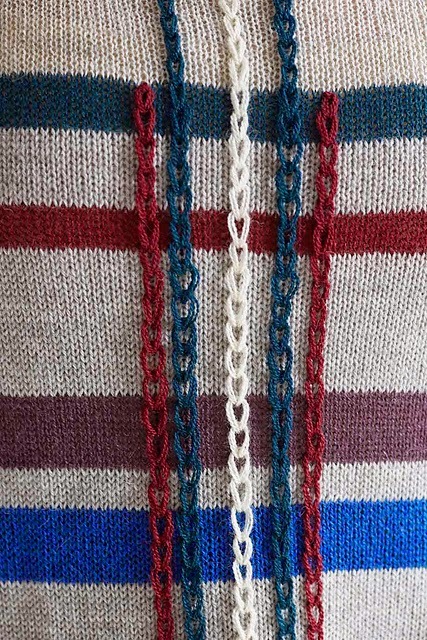 The sweater is essentially a striped sweater with crochet chains placed onto the front of the pullover to create the plaid. Genius! I love the updated twist on the traditional tartan; especially the chains that don’t run the entire length of the sweater and give it an ultra-modern feel. This is one of those sweaters that belongs in every woman’s wardrobe. Wear it to the office with a tailored skirt, change the skirt to something more fashion forward to have drinks with friends, or pair it with jeans on the weekend. You really can’t go wrong with this sweater. And with over 34 solid colors of Silky Alpaca Lace and 8 colors of Vail, if this color combo isn't your cup of tea, you are sure to come up with one that fits into your palette. Photos courtesy of Vogue Knitting, Paul Amato for lvarepresents.com, photographer. Summer is in full swing here in New England (and I suspect where you are as well). In fact it’s going to be over 90° again today. What’s a knitter to wear? The answer lies in one of our newer yarns, Bella Lino – a linen, viscose and cotton blend. Luckily Andi, our Customer Service Representative and Trunk Show Coordinator (who also wears many other hats), just finished her Whispers Tee in Bella Lino. This just might be the perfect summer tee. The long stripes of the Bella Lino effortlessly complement the simple stockinette. The yarn did all the work and all Andi had to do was knit (in the round, no less)! And because the yarn is so lightweight and airy no matter how hot it gets, she can throw it on and be comfortable and stylish. She did make a few changes to the pattern. Anticipating that the gathers were going to hit her in a funny spot, Andi knit another inch on the body before placing her decreases. The armholes were a little shallow to fit her comfortably so to combat this she added a few more rows after she shaped the neckline. 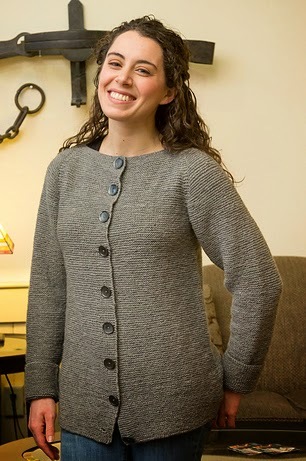 Finally, she decided she didn’t want the slit on the shoulders – the simple answer was to knit to do a three needle bind off on all the stitches for the shoulders. Andi already wore the tee to the office once and it looked awesome on her (unfortunately I wasn’t able to get a picture). I can see this being a staple of her summer wardrobe. It will look great with white pants, jeans, skirts…you name it! And once the weather starts getting cooler, she can wear it under a loose cardigan as a layering piece. There is something about this time of year that gets my fingers twitching and my mind racing about all the things I want to make for fall. I think it goes back to when I was a kid. It was always around this time of year my mom and I would go back to school shopping. And somewhere in my yarn obsessed mind I relate back to school shopping with sweaters. So it comes to no surprise that I am mentally lining up my queue of things to make. Yes…I already have a ton of things on my needles (including, but not limited to 2 afghans, 1 sweater, 1 pair of socks and a few shawls). But…I…just…can’t…help…myself. Our newest book, Every Day Knits, is full of great items that, well…you would want to wear every day. And the first one that I think is going in my queue is the Dunlow Sweater. When the photo sample of this sweater was being knit, everyone at the office was drooling over it. I love how the two lace patterns that Susan Mills chose work together. The pullover is knit in Mohawk Wool, our newest yarn (as you can see in a previous post…I really love this yarn). It’s one of those great sweaters that you will want in every color, because you will be reaching for it again and again. The other great go to piece in Mohawk Wool is the Buckhannon cardigan. I know you know how much I love cardigans and this one is no exception. Simple garter stitch really highlights the yarn and the shape of the garment. These two pieces are great three season garments. The yarn is light weight, yet warm. Perfect to pull on in those early fall evenings that are just around the corner, well into winter and again as a layering piece in the spring. Another great sweater in this book is Cameron by Susan Mills. Color blocking is a trend that is back with a vengeance this fall. Made from two colors of Chalet and one of Chateau, this turtleneck is not only stylish, but extremely wearable. While the bulk of the garment is stockinette, the color changes will keep you interested as it flies off your needles. Another trend this fall is bold stripes, so we made sure to included Albright in Every Day Knits as well. 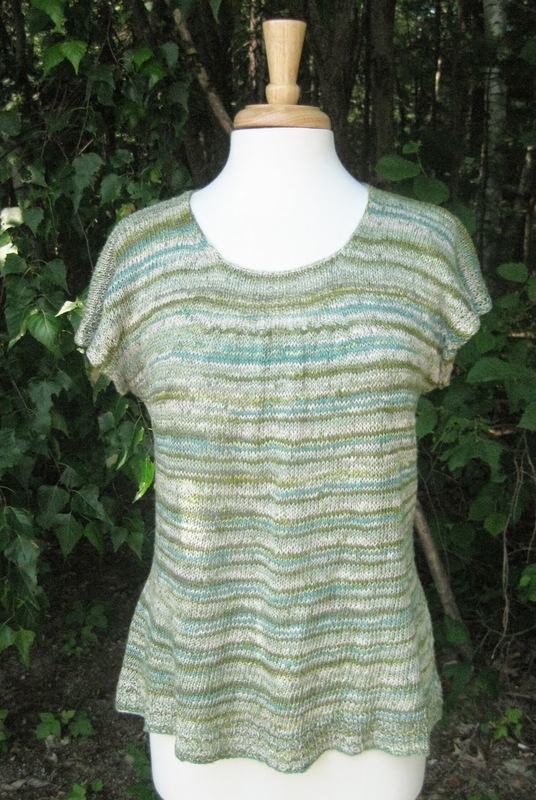 Also by Susan Mills, this striped raglan pullover, knit in Fresco, is worked from the top down – which means no seams! It features deep garter stitch split hems and cuffs. 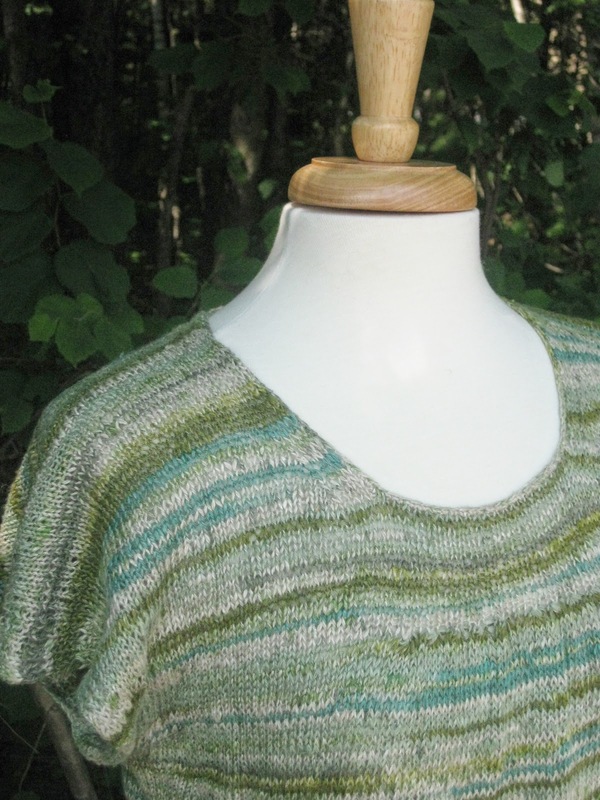 Next up is Ravenswood by Tian Foley, designed to be a simple pullover with just a hint of detail. Another top-down beauty, this pullover has a patchwork of textured rib on the front and the sleeves. Knit in either Blackthorn or Wynter, Tian wrote the pattern with your choice of elbow length or long sleeves. 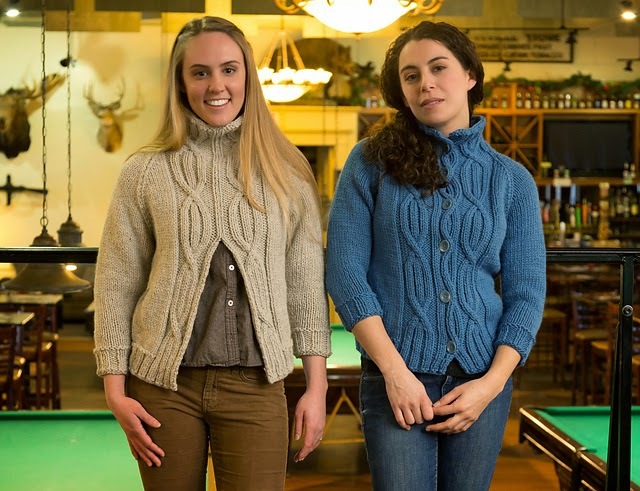 Our last duo of sweaters comes from Cathy Payson. The Rainelle pattern gives you a choice of a traditional cardigan or a pullover with a front slit. Or for yet another choice, sew the slit together for a more traditional pullover. Knit in either Blackthorn or Wynter, this sweater features cables that travel up the fronts and into the mock turtleneck. I can totally see pulling this on as a jacket in the fall, or wearing it as a sweater during those winter months that I don’t even want to think about yet. As you can see I have a lot of knitting to do (and there is never enough time). What is in your mental knitting queue for the fall? Haven’t started thinking about it? You’d better. It’ll be here before you know it. There is nothing like the feeling of hand knitted socks. Really. I promise. They are way better than any socks you could buy. They are warmer, much more fun and fit your foot exactly. Not they kinda sorta fit, cause you know, they have a lot of stretch to them. But they fit. Perfectly. Over the years I have made my fair share of socks. Some have lasted a long time, others…not so much. I have cursed and labored over a few pair, while others have flown off my needles. But each one has taught me something. Here are a few things that I have learned. 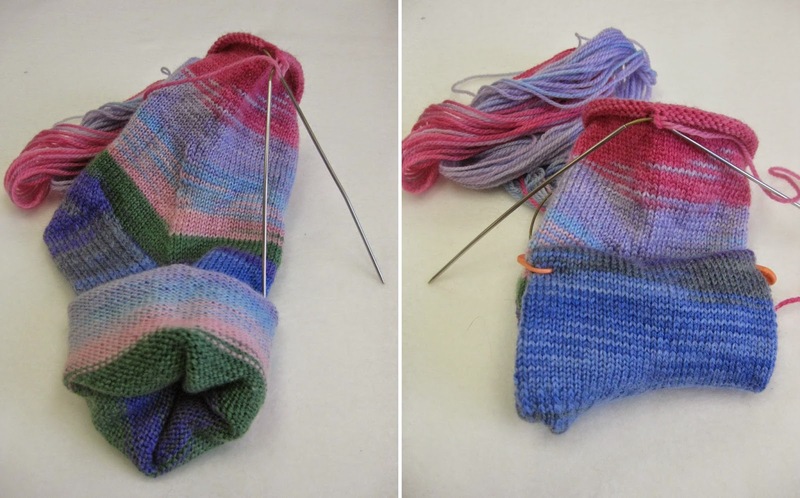 There are several ways to knit socks in the round – traditional DPNs, 2 circulars and Magic Loop. I am a big fan of Magic Loop, but what works great for one person may not for another. I recommend playing around with different techniques to find the one that is best for you. I personally get ugly ladders when I use DPNs. When I saw a friend knitting using the Magic Loop method, I knew that would be best for me. Even with using the Magic Loop method, I still sometimes get ladders in my work. I would pull that first stitch so tight that I thought I would break the yarn at every turn (and actually did a few times). But I found out that it’s not the first stitch that matters. It’s the second stitch. It’s a whole math thing that a friend’s husband (a mathematical genius) explained to me. I was skeptical at first (what does this guy who doesn’t knit and teaches algebra know about ladders in knitting after all? ), but I tried it his way. And well…he was right. Next is gauge, but not in the way you think. Yes, figuring out your gauge is still very important (you want your socks to fit), but another factor in gauge for socks is density. The tighter your gauge, the denser your fabric will be. The denser your fabric, the longer your socks will last. This means using a smaller needle size (I can hear you groaning though the interwebs), but it’s well worth it. If you are knitting cuff down socks, you will want to make sure that your cast-on is as stretchy as possible. One good way to do this is to cast-on on a larger needle. You can also cast-on over 2 needles to get a looser edge. 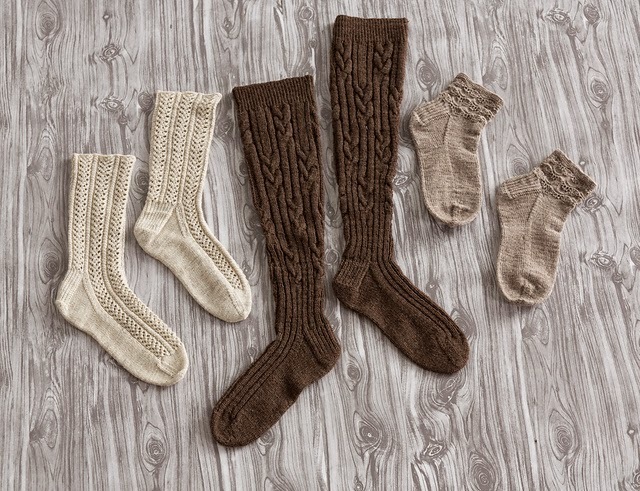 Cast on over 2 needles with Alpaca Sox for more stretch in a cuff-down sock. On the flip side, if you are knitting your socks toe-up, you want to make sure that your bind off is loose – you will want to get the sock over your heel after all. 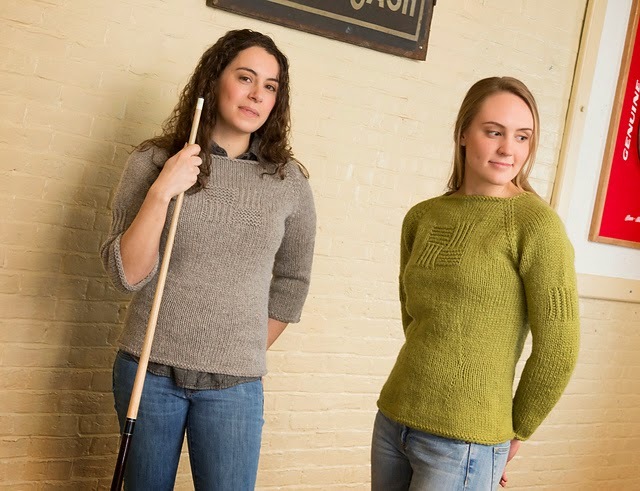 There are several good bind offs that provide stretch including Jenny’s Super Stretchy Bind Off and Elizabeth Zimmerman’s Sewn BindOff. You know how when you knit a scarf and you get to an awkward point, where it’s not so easy to flip the WIP, and at the same time, you can’t really twist it without feeling tangled? Yeah…that happens in sock knitting too. If you knit your socks cuff-down, you can fold them up inside the cuff as you go. If you are knitting toe-up, roll them up and keep the roll in place by using oversized stitch markers. Heels are important. For a long time I knit a short row heel. It’s an easy heel to do and doesn’t take much time (I can do one in about 35 minutes…I may have timed myself once or twice). But after a while I was noticing that I was wearing through those socks pretty quick and all in the same spot. It finally dawned on me that it was the type of heel that was my problem. Don’t get me wrong, I still love a good short row heel and for some people they are great. However, for my foot, they are a little too narrow and therefore the fabric wears out faster. I have since switched back to a traditional heel flap and gusset and am happy to report that my socks are lasting much longer. Have you ever followed a sock pattern so faithfully that you find you get little holes where you pick up stitches for the gusset? Especially at the top of the gusset? Did you know that you can pick up extra stitches there and just knit a couple of extra decrease rows at the end of your gusset? Yep. No one will know. I promise not to tell any of the designers. I find when working the foot portion of my socks that it is better to err on the side of caution and make them a smidge longer. There is a better chance they will shrink after many years of washing and wearing. Darning. This is a topic that can divide many sock knitters. Some do it, some don’t. It’s a personal decision that only you can make. If you search Pinterest, you will find a ton of tutorials on how to darn socks. I admit that sometimes I darn my socks, while other times I just stand over the trash can saying ‘darn, I really loved those socks’ as I throw them out. Wow…I still have about 100 things to tell you about knitting socks. But the most important thing is that you find what works for you. Do you have some tips for me? I’d love to hear them. Last week I told you about our awesome new yarn, Mohawk Wool. I started to tell you how much I love this yarn…it’s sourced and spun in the U.S.A., made from undyed fibers, and the perfect (IMHO) weight…but honestly it would take about 100 pages of a book to delve into the depths of my love for Mohawk Wool and I know you don’t have time to read that. This blend of Merino, Romney and Nylon is the perfect yarn for making socks. Now, I know not everyone is a sock knitter…some people have trouble with such small needles or knitting in a small circumference (no matter the technique) and some people just don’t like handknit socks (gasp…that hurt, just typing that). But knitting a pair of socks out of Mohawk Wool might just change the minds of these knitters. We have 3 beautiful sock patterns in Every Day Knits made from Mohawk Wool…each with its own unique flair that highlights the beauty of the yarn. The first pattern is for anklet socks from Jill Wright. The Delbarton socks are a traditional top down pattern with a lace and texture stitch on the cuff. The pattern is lovely, while remaining easy to memorize. These would look awesome with a pair of converse or really any other shoes. And if you like your socks a little longer there is plenty of yardage on a skein of Mohawk Wool to make a traditional mid-calf length; just knit more before starting your heel flap. When Tian Foley starting thinking about socks from Mohawk Wool, she immediately thought of knee high socks and the Kenova socks were born. She also knew that she wanted to use a cable and rib pattern that would really pop. She alternated the rib stitch with a cable to ensure that the socks would have enough stretch to fit over the calves of the wearer. These socks look great with boots and a skirt as shown, but would also look great with a pair of Mary Janes or even as an extra layer of warmth under pants/jeans in the winter. Our last pair of socks from MohawkWool are the Bayard socks, designed by yours truly. I have had this sock pattern in my head for years and as soon as I saw the Mohawk Wool, I knew I had to make them. I fell in love with the stitch pattern many moons ago, and while I knew I could just do the cuff of the sock in the pattern and the balance in stockinette stitch, I really wanted to use the lace and cable pattern on the whole sock. Although the stitching looks complicated, I promise it is very intuitive. If you are a sock knitter, or even just thinking of making your first pair, you will want to stay tuned this week. 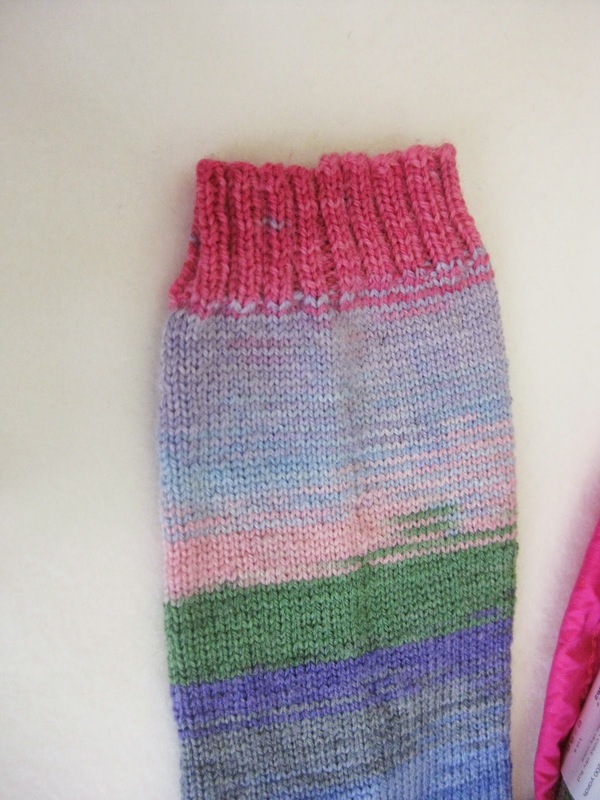 Our WIP Wednesday is a sock and we will have some tips for you on Friday. Summertime…what do you knit? It’s been very warm the past few weeks here in New England and I am sure it’s not too different where you are. It’s too warm to work on the blanket I have on my needles (at least without cranking the A/C). So what should I knit? For me the answer is easy…socks. They are small (so there isn’t anything on my lap) and the yarn is thin (so it’s not too hot running through my fingers)…but it’s still knitting and I get my daily fiber fix. Socks also make a great travel project because they are small and easy to pack (also good subway/mass transit projects) and since a lot of people travel during the summer, it’s a perfect match. Luckily I know I am not alone in this thinking. How do I know? 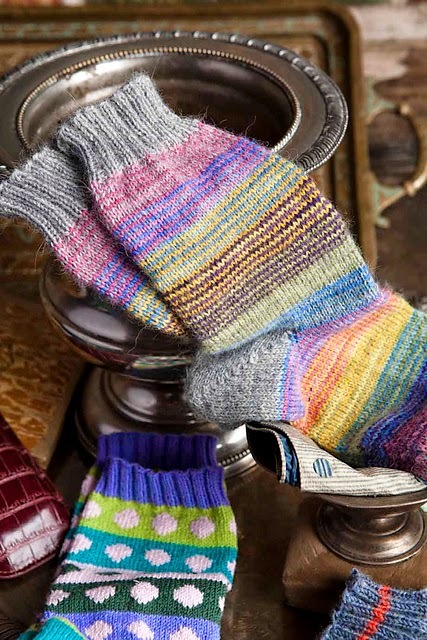 Because of the beautiful spread in Vogue Knitting Early Fall on Socks by John Brinegar! I look at them, pulled the magazine closer to my face and looked again. I thought “Wow, those socks are beautiful. I love the way the yarn stripes like that.” Imagine my surprise when I flipped to the pattern to see what yarn was used and it was Alpaca Sox! It was our yarn! I was giddy to say the least. 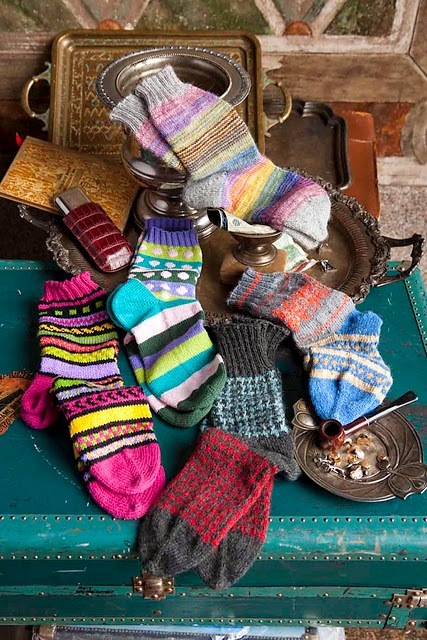 John used seven colors of Alpaca Sox to make these socks. He came up with a beautiful stripe pattern where he changed colors every round. Seven skeins of Alpaca Sox is a lot of yarn. So we came up with a few ideas to help make these beautiful socks without breaking the bank. Get together with some of your other sock loving friends and split the skeins. 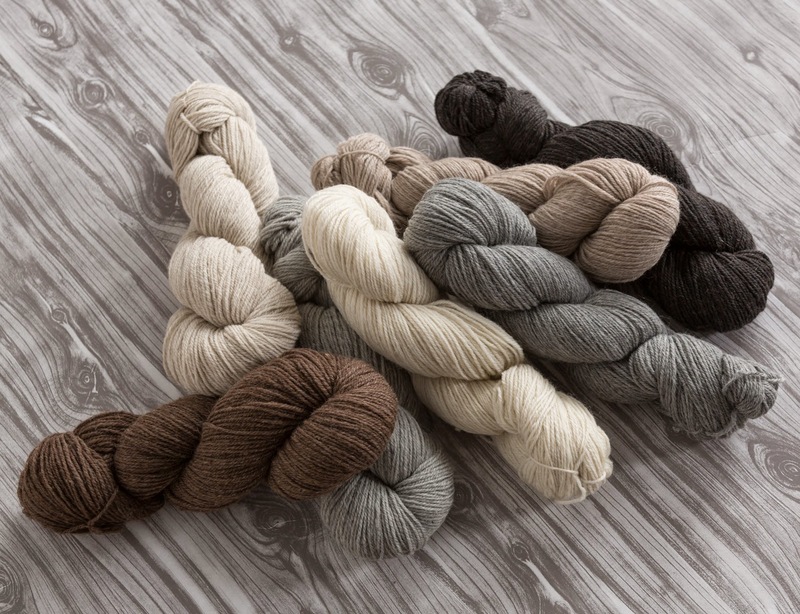 We are guesstimating that you will be able to split the colors with three other friends, but each of you may want your own personal skein of the Ash color (which he used for the cuff, heel and toe). You’ve never split yarn evenly into separate balls before? It’s easy. First you want to find a kitchen scale and a ball winder (not as necessary…but it does make it easier). The next thing you want to do is wind the whole skein (100 grams) into a ball. Put the ball onto the scale and set the yarn up to wind on the winder. Now simply wind off 25 grams and cut the yarn. Repeat twice more. You should now have 4 balls of 25 grams of Alpaca Sox. This would make a great mini knit-a-long! 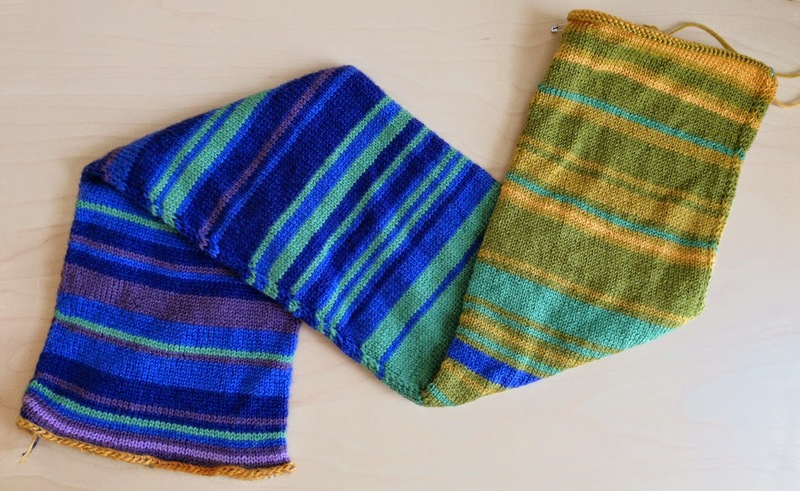 How about split the yarn with someone who loves the stripe sequence, but wants to make a cowl out of it instead? I actually love this idea and have cast on for a cowl myself using the colors recommended. I used a provisional cast on and started with first stripe sequence from John’s pattern. Right now I am planning on using his whole sequence…but I may change my mind as I get further along. With seven colors, you will only need about a half a skein of each color to make a double loop cowl, which still leaves plenty of yarn for your socks and maybe one extra pair. Why stop at a cowl…how about a scarf or a hat? Or make a pair of socks and a matching cowl. 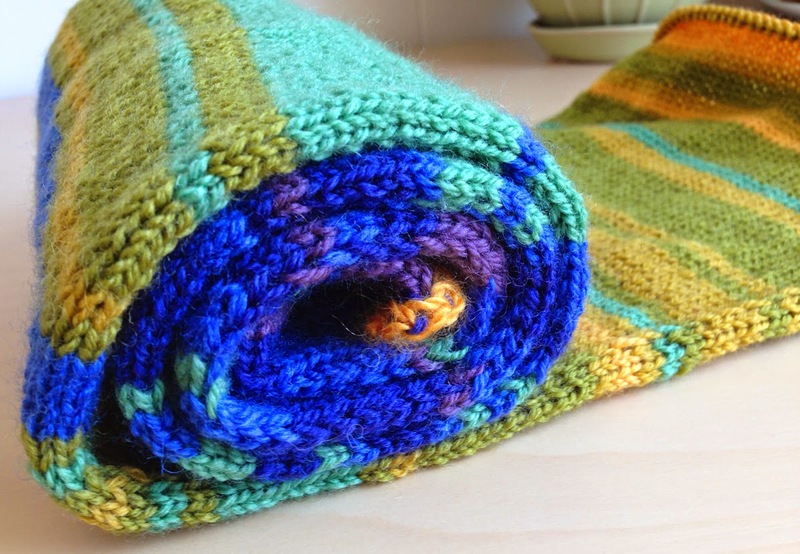 How about using the leftover yarn for a mitered square baby blanket (I am sure you have some other ends of sock yarn lying around that you can add to it). I think that you get the idea…there is always something to do with your leftovers. Now, I happen to love the colors that John picked, but maybe they are not your cup of tea. That’s ok. We have a ton of other colors in the kettle dyed Alpaca Sox to choose from. Not into making your own stripes? That’s ok too. We also have a bunch of hand painted colors in Alpaca Sox that would make beautiful socks. Photos courtesy of Vogue Knitting, Paul Amato, photographer. Ever wonder what a year in temperature would look like when you look back on it? Our Graphic Designer Meg did. 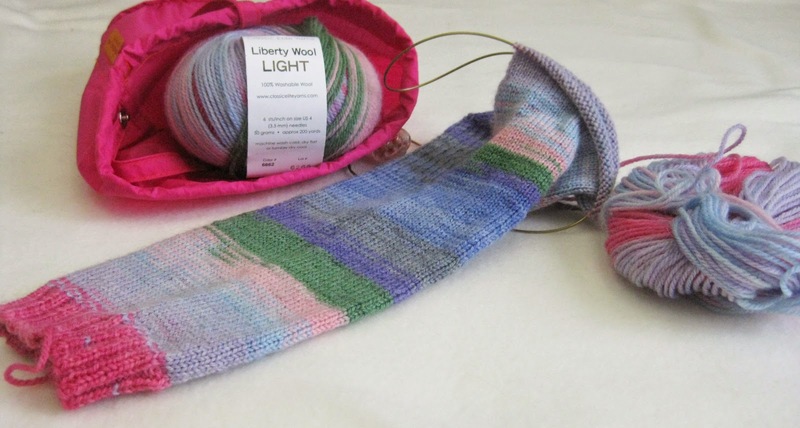 Inspired by the My Year inTemperature Scarf, Meg decided to make a cowl using Liberty Wool Light. Meg used a provisional cast-on and is planning on making her tube into a loop on December 31 (or shortly thereafter). She is knitting 2 rounds for every day, using colors that correspond to the day’s average temperature (instead of its highest tem). Meg’s boyfriend is a geographer and found a temperature scale that is used in "official" maps. 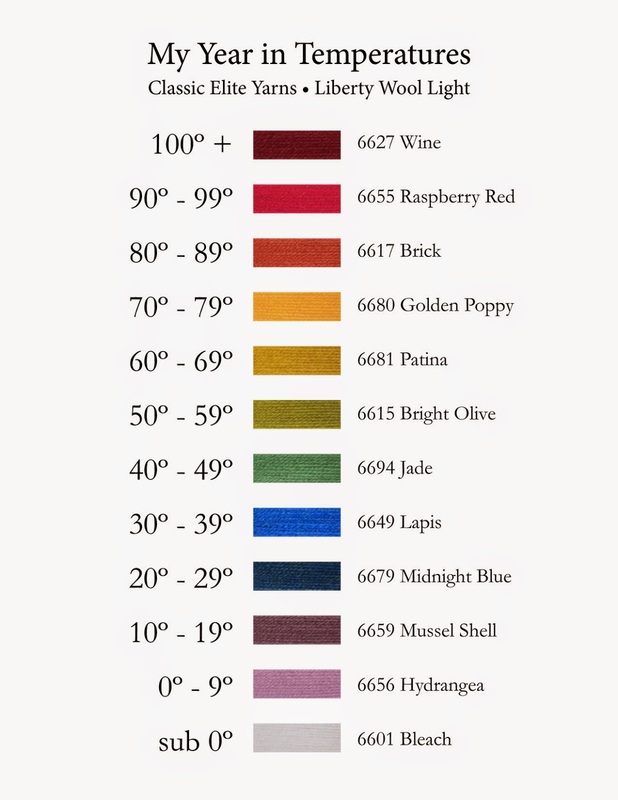 She then chose colors of Liberty Wool Light that most closely matched the scale, but instead of having a different color for every 5º F, Meg chose to note the temperature breaks every 10º F.
As you can see Massachusetts had a cold winter. And everyone at the office is hoping that she never gets to use the Wine (or even the Raspberry Red). Knitting a tube is perfect for Liberty Wool Light because it is a lightweight yarn, but the scarf will still have plenty of body (and, at my gauge, be about 90" long). Also, a tube avoids the conundrum of WS/RS when knitting stripes while also hiding where I carried unused colors up the work to avoid cutting them. I started my scarf on Jan. 1, 2014, but that's just a pretty date. Starting at a different time in the year would change the look by altering the color progression (perhaps yellow/orange on the ends and blue in the center). It is perfect lunchtime knitting a few days a week. As long as I keep up, it never takes much time to knit a few days. The photos show my scarf up to June 11th; I've fallen a little behind. As to whether or not I'll weave in my ends or just knot them, that's yet to be determined. It’s been fun watching her progress at the lunch table and seeing what is going to happen next. So without further ado, I introduce to you…Mohawk Wool! Mohawk Wool is a 3 ply sport weight yarn that is sourced and spun right here in the USA! Made from Merino, Romney Wool and a touch of nylon, this yarn is a beautiful addition to our MountainTop Collection. From simple stockinette to complex cables, the stitch definition on Mohawk Wool is nothing short of amazing. I can honestly say that working with this yarn was pure joy (I got to knit one of the samples for the book) and cannot wait till I have a couple of things off my needles, so I can cast on a few projects with the Mohawk Wool. One of those projects is the Kimball Shawl from our newest book Every Day Knits. You might have already seen it, since it was featured in an ad in Vogue Knitting Early Fall. When Tonia Barry designed this shawl, she wanted a traditional Shetland vibe with a twist. I think she accomplished her goal. She started with a traditional top down triangle pattern. She wanted to add to the wingspan of the piece without adding length, so she experimented with adding short rows. She then added a feather and fan border, but used different colors of the Mohawk Wool to really accent the scallop nature of the pattern. Both Mohawk Wool and Every Day Knits are available now in many LYSs. One of the nice (many) things about working for a yarn company is that we get advance copies of the knitting magazines we run ads in. Now, before you get too jealous, we only get them a few weeks before they hit the newsstand (I know that isn’t much consolation and that you are probably a shade of green right now). 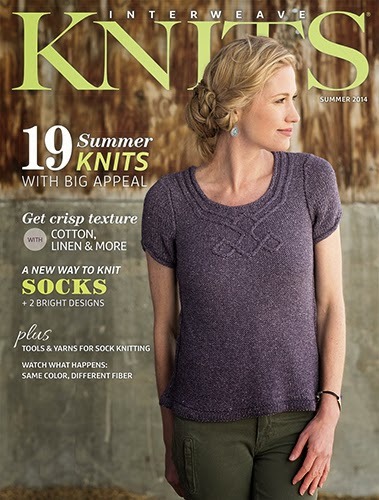 Not too long ago we got our advance copy of Interweave Knits Summer 2014. It quickly got passed around the lunch table while we all chatted about what we wanted to make and how we all wish we could either knit faster or knit in our sleep, while counting our WIPs out loud (though I know I have a few I haven’t admitted to everyone yet – there are just soooo many). 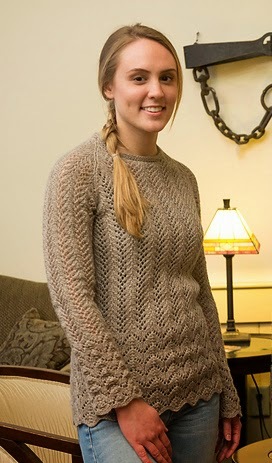 It didn’t take long before the Kayleen Pullover by Cassie Castello on the cover caught Betsy’s (CEY President) eye. It’s a great summer time piece – simple with just the right amount of detail on the neck. The conversation quickly turned to what yarn she was going to use. At 4 stitches to an inch she had a few options –Seedling, Mesa, CottonTail. Betsy decided on Classic Silk, she hadn’t worked with it in a while and it was due to be on her needles. She jumped up from the table to see what colors we had in stock and ended up picking 6946 Stream, which is going to look really nice on her. Because the piece is Stockinette stitch and worked in the round from the bottom up, it’s been a great travel piece for her (it’s actually Stockinette stitch on the back, and reverse St st on the front). You know – something she didn’t have to totally focus on, but it was still knitting and keeping her hands busy. Betsy is almost finished with the neckline and really enjoyed working the cables. Up next…the sleeves. She is planning on modifying the pattern to make a traditional sleeve, without the notch. It won’t be long before we will be seeing her sporting the top around the office.